But we cannot just give up. We Remainers need to keep up the good fight, support one another through the tough moments and wave the blue flag with the yellow stars. We might be able to stop the worst excesses of Hard Brexit if we stay loud and united. There are already signs that some Cabinet ministers are realising that we will not be able to thrive outside the single market. And even if not, even if we go down the hardest of hard routes, there is still one very simple reason to stay involved: we are on the right side of history. Even in the darkest moments of these long, arduous months since 23 June 2016, I have held on to the thought that when all this is history, I will be able to tell anyone who asks that I was a Remainer, that I fought for what I believed in, that I wanted Britain to stay connected to Europe, to be strong and proud and open. I can look at myself in the mirror and know that I am doing what I can, even if it is a mere drop in the ocean, to stem the horrible tide of Hard Brexit. What is it that we are doing as Islington in Europe? We are keeping the conversation going: organising street stalls, hosting public debates at Union Chapel, attending meetings and conferences, leafleting, organising support for marches and coordinated protests — you name it, we’re there. 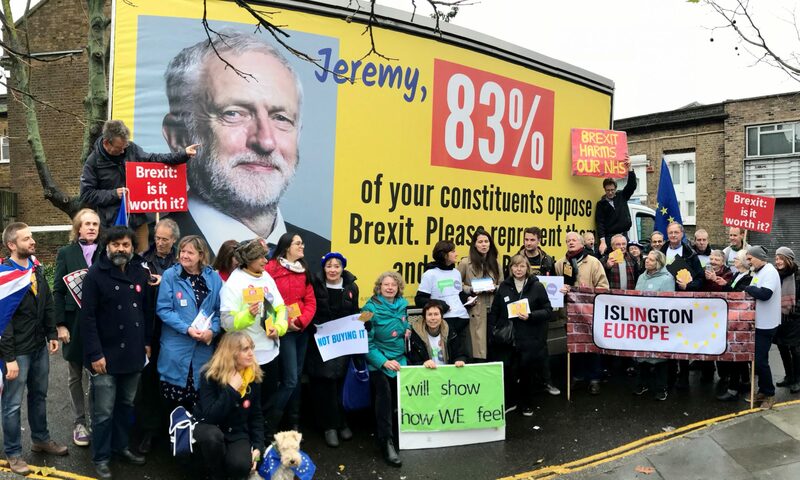 And we are not just working in pro-Remain Islington. We are also talking to the Leavers in their strongholds. It’s not always an easy conversation to have — I have been called everything from a Nazi to a traitor and in between — but these exchanges really matter. We want to convince them — through debate, through argument, through sharing experiences — of the merits of staying in Europe, or as close as we possibly can. We are also taking practical and meaningful steps: writing letters to our MPs, writing letters to our newspapers, coordinating with other pro-European groups and movements across the country. We are also organising regular events for EU nationals to obtain free legal advice from our immigration lawyer volunteers. We want our European friends to know that we want them here, that we value them and also that we care about them as people, whose lives are being plunged into needless and callous uncertainty over Brexit. If you’re one of us, a proud Remainer and a citizen of Europe, there is so much you can do to help. Email us, tweet us, find us on Facebook. Come to our meetings, write letters, do as much or as little as you like, whatever time you can spare, from home or elsewhere. There is a role for everyone. And together we will be so much stronger and we can raise our voices against this madness. We all have moments of pessimism and thinking we might as well just get on with the misery, but we have to resist these moments. We have to keep fighting. We want to be on the right side of history — the side of peace, unity and collaboration, the side of openness and vibrancy, the side that stood up to being insular, to turning our backs on our friends and allies, to racism, to mean-spiritedness.